I’ve never been big of fairy tales, but the description of this novel had me intrigued. 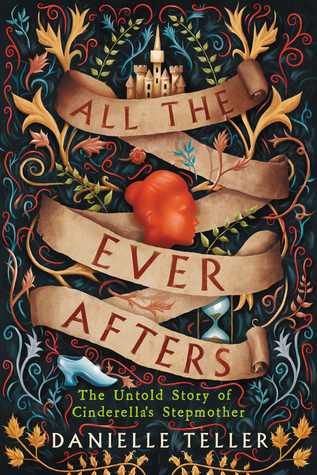 “All the Ever Afters” is the story of Princess Cinderella told from the point of view of her stepmother, Agnes. Agnes has heard all of the rumors….how cruel she apparently was to Elfilda (Ella), that Ella’s step-sisters vied for Prince Henry’s attention, and so much more. Princess Elfilda (Ella) is now the most celebrated woman in the kingdom. Commoners will wait for hours in hopes of catching a glimpse of her face. Any time she changes her hairstyle or tries out a new accessory….every female, even the peasant girls will do what they can to imitate her appearance. Agnes knows more about Princess Elfilda’s history than anyone. But it’s not as much of a fantasy as everyone might believe. However, Agnes is not going to write the princess’s story, she’s going to write her own. Agnes was only ten when she was sent to work as a servant at The Manor House, leaving her family behind. She thinks the Manor is beautiful but she doesn’t yet know the evilness that goes on behind closed doors. Agnes yearns for home. All she has is a little clothing and her treasured collection of stones. Although her future is bleak, Agnes is creative and clever and finds ways to make herself indispensable wherever she is sent. She makes her way in a world that is built to keep her down. Then she meets someone who changes the course of her life completely. Agnes feels that she may have finally found a place where she can be happy. This was an interesting read and the prose was often poetic. I don’t think I will ever look at any fairytale in the same way….especially Cinderella. I liked the short chapters and enjoyed reading Agnes’s journal which was interspersed throughout the novel. We are given insight into both the past and the present. I did have a bit of a hard time in the beginning. There were lots of names and titles to try to keep straight. It was a slow burn but it did pick up and I found it to be quite an entertaining story. A creative and unique story that gives a deeper perspective on good and evil, complicated relationships, and the many different kinds of love. It also shows that everything is not always what it seems. I look forward to reading more from this talented author. I’d like to thank William Morrow for giving me the opportunity to read this book in exchange for my honest review. Creative and unique is what came to my mind too when I read the blurb. Its such an interesting angle to the fairy-tale. I am already thinking about the step-mom now and her story . Great review Deanna. Thank you so much! It really was done in an interesting way. I look at the story in a completely different way now. Than you!! It does bring back memories! Ooh! This sounds like one for me and the cover is gorgeous! Great review! Cool that this was so creative and unique! It sounds awesome! After reading yours and Carrie’s wonderful reviews, I just requested and received this from Edelweiss. I am looking forward to reading it. I’m excited to hear what you think. I did find it slow to get into but really enjoyed the story. My mom is reading it now and she’s really enjoying it. I hope you like it! I love “untold stories” of fairytales and mythology!! Have you read Circe by Madeline Miller yet? Also, there’s a great hidden gem I picked up at a used book sale once called Fairest of Them All. It’s Rapunzel’s story—she has her “happliy ever after” but then becomes the evil queen from Snow White. It was good!